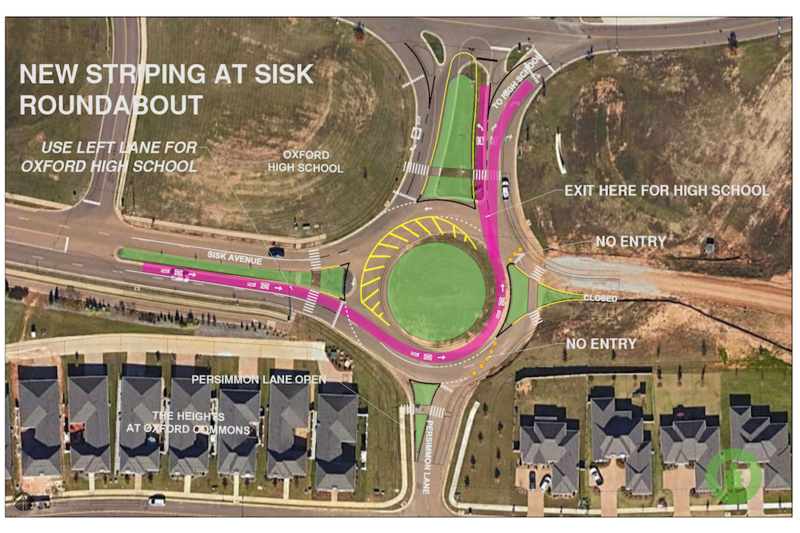 Please be aware of changes to the Sisk Roundabout at Oxford High School. Drivers going to Oxford High School must use the left lane of Sisk Avenue to access the school. During the summer, a concrete island was built which reduced the roundabout to one-lane width. Drivers will no longer be able to access the school from either lane. The right-hand lane will be temporarily barricaded after Persimmon Lane until the new road extending Sisk to the east is completed. Please merge into the left-hand lane of Sisk Avenue well ahead of the roundabout to allow for a smooth flow of traffic. Remain alert in the area as other drivers adjust to the changes.